Enjoy this full video to see three different view points of the same timed run! 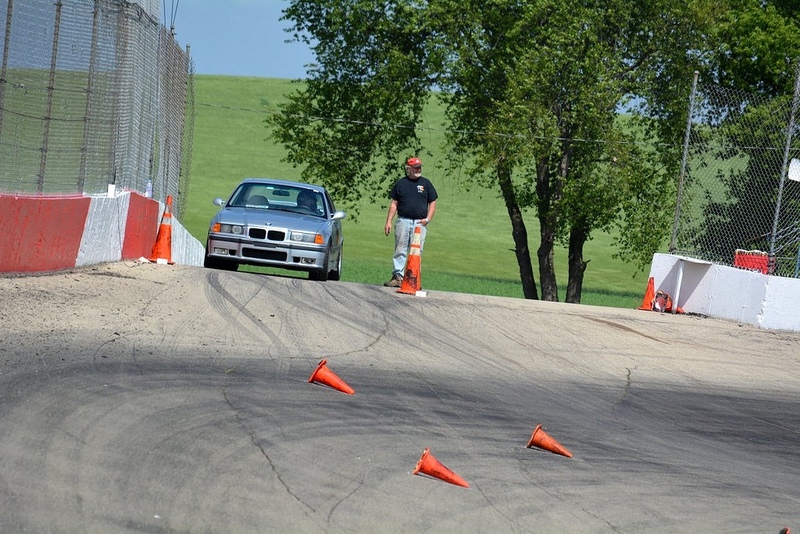 The Madison Sports Car Club's autocross series has been in operation for nearly 50 years. 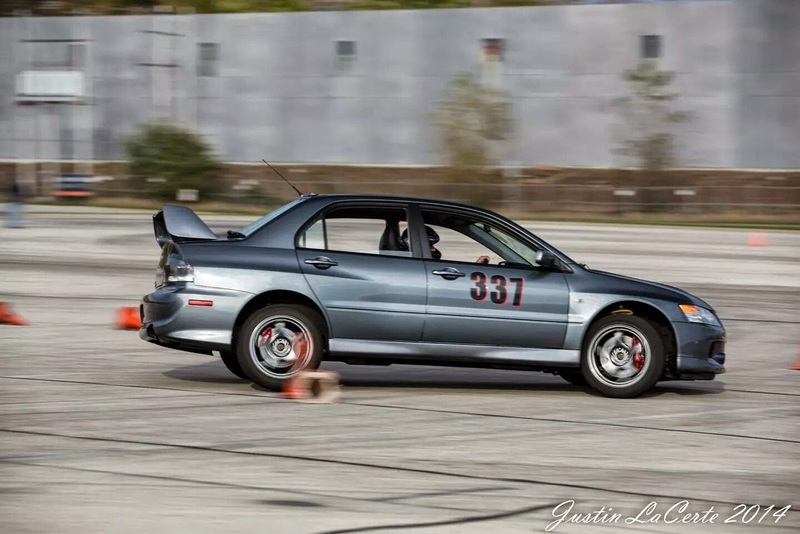 This year, we are hosting many Autocross events around the Madison area. We utilize area parking lots to provide a legal and low-risk environment for you to drive your car at its limits. 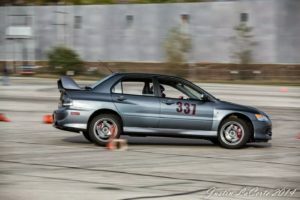 An autocross is simply a time trial event. Typically, a road course is set up using orange traffic cones in a large parking lot. One driver at a time negotiates a course laid out with the cones, or pylons, testing their skill against the clock. Time penalties are charged for hitting the cones. Afterward, your times are compared to others in your class to see what place you came in. An autocross is run in both the dry and in the rain, which often presents new challenges to drivers. The cost of event entry for most venues is $45 for non-members and $35 for members. You can easily see that if you decide to join the club for $50, you'll save that much just by attending four events. High speed autocross, high performance driving events, wheel to wheel events, etc are much more expensive, ranging from $150 to $400+. How much wear and tear on my car? For the beginner, there is very little wear and tear. With one event, you probably won't notice any wear at all. As you compete in more events, the one thing you will notice is the faster wear of your tires. Hitting a cone generally leaves no marks. However, on occasion, one may show up on your car. The marks usually will come out with a little bit of buffing and waxing. As you become a serious competitor, you'll find that other items that are affected by autocross are brakes and suspension components. It should be noted that MSCC can not be held responsible for any wear and tear on your vehicle. You have to remember that even though you are driving at relatively low speeds (typical max speed is 60mph), you are still driving your car at its limits. It is possible for accidents to happen. With that said, we have never had a claim on our liability insurance. As long as the driver keeps his wits about him/her, there shouldn't be any problems. We do set up the course with safety in mind, and work around obstacles that may be in our way. What is a class? Which class am I in? To keep competition fair, each car is classed according to its performance abilities. This keeps Dodge Vipers from directly competing against VW Foxes. A number of people make modifications to their vehicles. As modifications are added, a point value is assessed. The points determine if you run in Stock, Prepared, Modified or Race categories. For cars unchanged from the factory, they will run in the stock category. We have a class for every vehicle, from cars to trucks to karts to anything with four wheels. Anyone on staff can help determine what class you belong in. However, the final authority of class comes from the technical inspector and autocross steward. Yes. Prior to being allowed on course, your car must pass a technical inspection. Tech Inspection is there to make sure your car meets basic safety qualifications. Tech will check for things like loose wheels, positive response on your accelerator and good pressure in your brake system, among other things. In addition, one of the requirements to run is that your vehicle is emptied of all loose objects, from floor mats to spare tires, and tech makes sure you've done that. Please see the rules for a complete list of Tech's inspection. Tech exists to help keep our operation safe. Any disputes can be made with the autocross steward. You don't need anything in particular. You need a 4-wheeled vehicle that is safe. We have a strict policy of "Run what you brung." We will always find a class for you to compete in. We typically don't recommend competing in rollover prone vehicles such as large vans and SUVs. However, you are always welcome to compete regardless of our recommendations. MSCC allows any licensed driver 16 years or older to compete. We also allow children ages 12-17 to compete in Karts that comply with our rule book. Drivers under the age of 18 must have a legal guardian present at the track the entire day, and both the child and guardian must sign a minor waiver. Do I need to be a member of MSCC? Absolutely not. However, members do receive a number of benefits, including an official copy of our GCR (General Competition Rules), name tag, a subscription to our monthly newsletter, and special pricing at autocross events. Membership costs just $50 and you can register at any of our events. For the beginner, the only thing you absolutely must bring with you is your entry fee ($45 non-members/$35 members) and driver's license. You are required to use a helmet on course, but we usually have limited loaners available. As you enter more events, you may wish to purchase your own helmet. Currently, any Snell rated M85 or SA85 or newer helmet is acceptable. Helmets only DOT rated are not acceptable. We also recommend you bring basic supplies with you, things like water, sunscreen, rain gear, and basic tools. We run rain or shine. For more information, please read about the typical day.